We pulled out a few of the newer Christmas toys this week for the little man to play with, so he was rather thrilled. 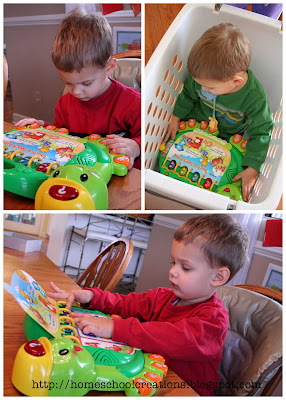 I apparently underestimated him when buying some of the toys (sigh), since he has already 'mastered' some of the puzzles. But as long as he enjoys doing them and playing with them, we'll keep using them! Although we have the smaller leap pad, Kaleb isn't quite up to it yet so he has another toy that is similar and does alphabet and counting - just the basic things. Since he is becoming more interested in singing the alphabet he is more interested in this one now. Another day he lugged it around the house with him and let his sisters push him around in the laundry basket while he played along. 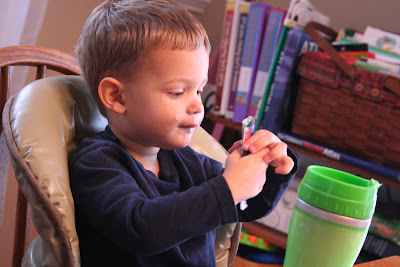 Kaleb is also loving his stringing beads and figured out how to get them on the string all by himself this time! He actually did quite a few and then dumped them all over the table. 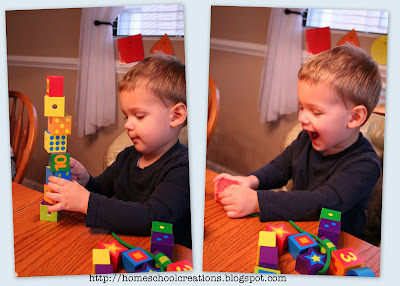 He then started stacking the square blocks and building a tower. He was so thrilled with himself! 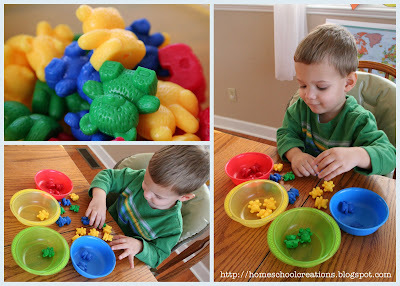 We also pulled out the colored bears for sorting this week to see if he could continue to sort the four colors, which he did! Yeah, Kaleb! Kaleb has been having fun discovering the difference between hot and cold. We freeze our gogurts and so he sits at the lunch table saying "Cold? Cold?" while squeezing his gogurt. Then later he runs over to the stove asking, "Hot? Hot?" He's got it down now!! 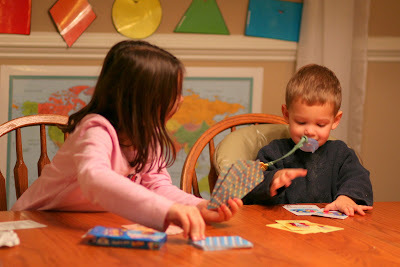 Laurianna also had fun trying to teach Kaleb how to play Go Fish. We have some great cards from Alphabet Alley that are nice and thick (you can read more about them here). Love them!! Years ago I bought a cd from Discovery Toys called Sounds Like Fun. Every now and then we've been playing it and Kaleb LOVES the alphabet sounds song on the cd. 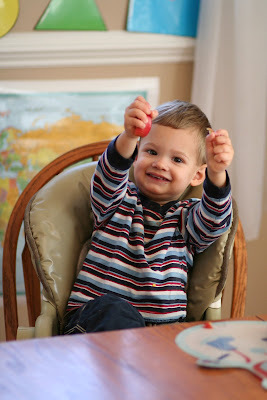 Here he is at the table singing along and raising his apple in the air while singing "Apple, apple, ah, ah, ah." (If you don't have this cd, I'd highly recommend it!!). 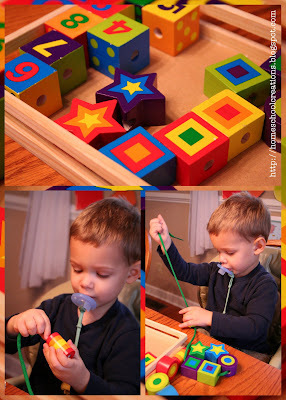 Be sure to visit Carissa at 1+1+1=1 for some more Tot School posts! Have a great week! Wow, I am so impressed with his abilities at his age!!! Ky is 32 months and we have those exact beads, he still will barely string them! We sort by color some now, but he would definitely not participate several months ago! Your little man is so cute, I love seeing his expressions in the great photos you get of him! !